Loyce graduated from the Fashion Institute of Design and Merchandising in Los Angeles. While working in the retail industry, Loyce landed a job as head designer for a Los Angeles boutique. This is where she honed her couture skills and became renowned among private clientele for her custom ready-to-wear and evening wear. When asked to create a wedding gown for one of her clients, the process sparked Loyce's love for luxurious fabrics and she became inspired by the intricacy and the fine craftsmanship that went into creating an artisan wedding gown. Realizing that creating custom couture wedding dress had become her passion, and after much encouragement and consideration from her private clientele, Loyce opened Grace Bridal Couture in 1995. A bridal studio for women who wanted a personalized custom made wedding gown to reflect their individual style and vision. The opening of a bridal studio allowed Loyce to share her vision of beautifully crafted one-of-a-kind wedding gowns not only with private clientele but with every bride to be. Passed down from her great-mother to mother, Loyce has over 62 years of fine couture tailoring tradition which translates into her creating exquisite, regal and sophisticated wedding gowns with a modern twist. Her design aesthetic mixes traditional, modern, classic, contemporary, and simple chic designs. The wedding gowns that she makes are handmade fashioned in luxurious silks, French Lace, embroidery and intricate beadwork which is her signature trademark. She also incorporates expert corsetry into every gown for a perfect fit that enhances the female form. 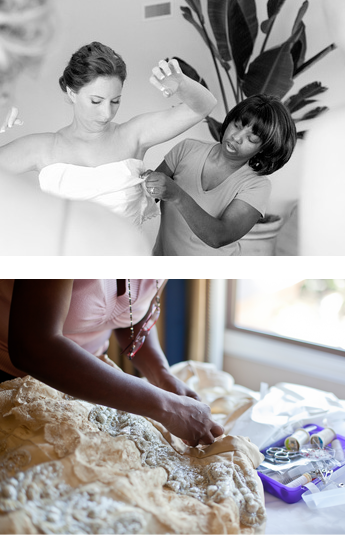 As the award-winning Designer and Owner of Grace Bridal Couture, Loyce provides personalized one on one attention to every client. By taking the time to understand each client’s unique ideas and desires, Loyce expertly translates their vision into a one-of-a-kind reality. Having very high standards for her craft ensures that the quality and workmanship of her handmade Grace gowns are unparalleled. Her ultimate goal is to create for you a fantasy dream wedding gown for the most memorable day of your life with an unforgettable experience.